(Photos) c.1850 Daguerreotype San Francisco Trade Card. 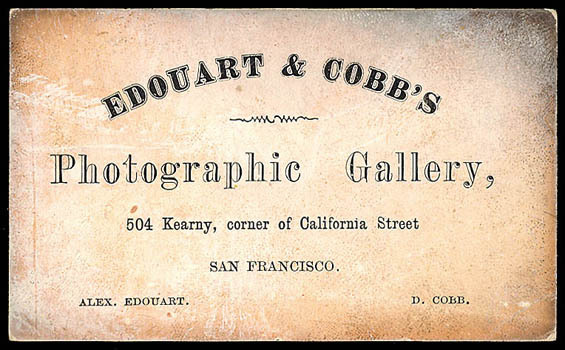 Lovely trade card for Edouart & Cobb's Photographic Gallery in San Francisco, on coated stock; slight discoloration around edges, still rare. (Photos) Coloma Band and Regional Photographs. 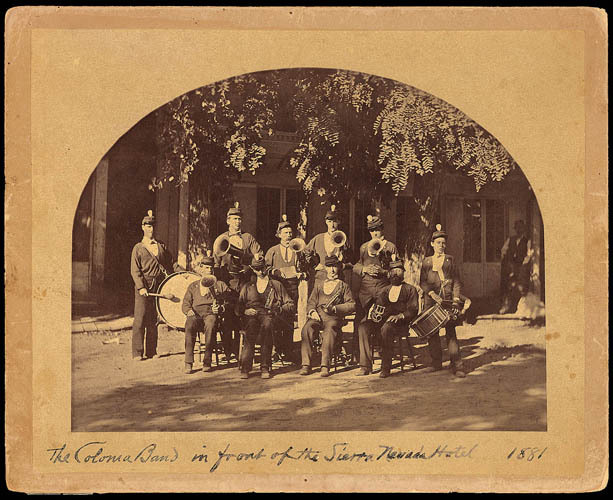 Three 9x7¼'' sepia photographs; two titled "The Coloma Band in front of the Sierra Hotel (May Day) 1881" showing two different band scene, with additional information on reverse including band member names, third entitled "Dutch Creek - across the American River (South Fork) at Coloma" showing river scene and Mt. Murphy. 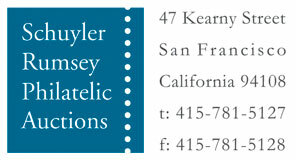 (Photos) Sutter's Mill Woodblock & Photographs. 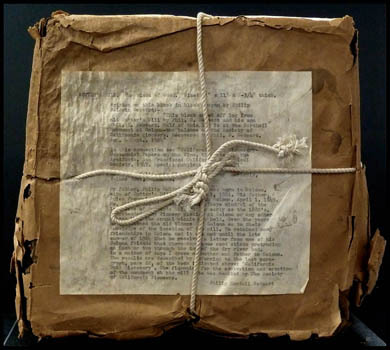 Includes a 11x11x5¾'' block of wood with inscription written in black crayon by P.B. Bekeart "This block sawed off log from old Sutter's Mill by Phil. K. Bekeart. Half of this log is at the Marshall Monument at Coloma - the balance at the Society of California Pioneers. Recovered by Phil. 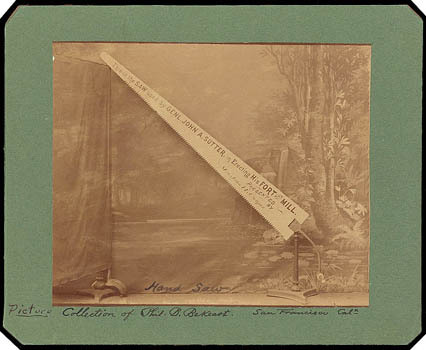 B. Bekeart, Aug. & Sept. 1924"; photographs include 5x4'' photo of large hand saw with inscription "This is the saw used by Genl. John A. Sutter, in Erecting his Fort and Mill. Presented by Mrs. John H. Cooper", and 10 10x16'' photographs taken by Charles Weidner in 1919 of various early historical Coloma buildings (including one of Marshall's cabins) and river scenes with written commentary by Phil. Bekeart. (Photos) Coloma Stores, 1849-50. 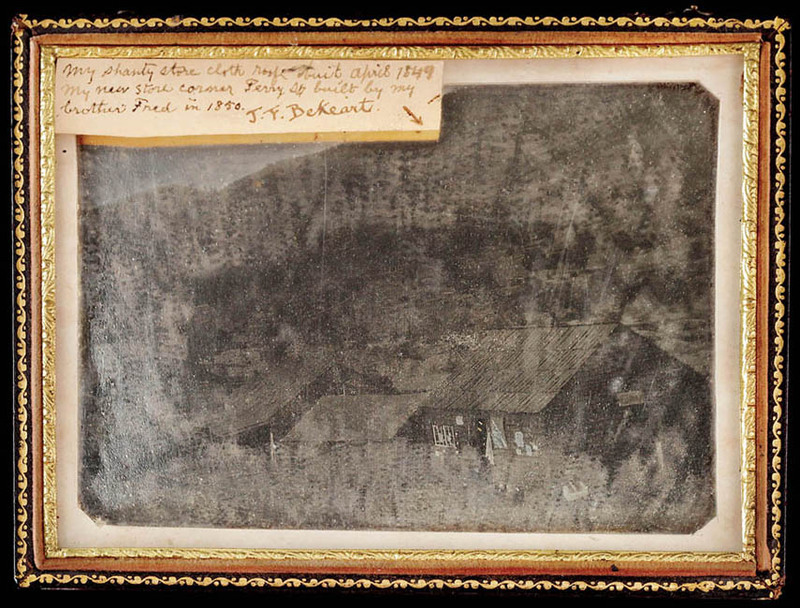 Rare half plate daguerreotype in velvet lined case showing one of the first stores in Coloma, the site of first gold discovered, store shown is a ramshackle building with cloth roof and sign, with small near contemporary label attached on upper right corner "My shanty store cloth roof built April 1849, My new store corner Perry St. built by my brother Fred in 1850. J.F. Bekeart"; mirror-like finish but easily seen at correct angle, with post-1949 note from relative Phil. K. Beckeart regarding original note by J. Francois (Frank) Bekeart, daguerreotype in unusually nice condition, Very Fine. For centuries the Nisenan Indians went about their day to day lives in the Cullomain Village in the plush and abundant Cullumah Valley. On January 24, 1848, their world, as well as the rest of the world, changed forever. James Marshall hired by John Sutter to build a lumber mill and supply materials for Sutter's dream empire "New Helvetia" discovered gold in the tailrace of the new mill. Jules Francois Bekeart was a gunsmith who came to Coloma in 1849 to mine gold and soon became a friend of James Marshall. The hard labor of gold mining was not to his liking, so "Frank" Bekeart started a highly successful gunsmith business in a wood frame and canvas building near this site. A brick building was later constructed in 1852 after the wood building burned. It is thought to be Coloma's oldest structure. (Photos) Mining Scene at Coloma in 1850. 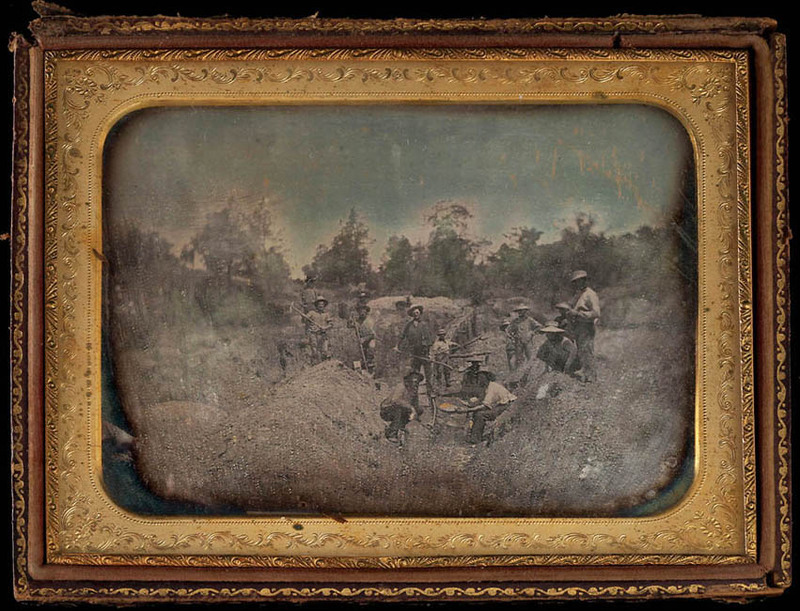 Rare quarter plate + in size daguerreotype in velvet lined case showing group of Miners including Chinese Mine Workers With Pans, Log Tom and what appears to be a Rocker, a rare mixed group shot, with note attached to inside velvet on Phil. B. Bekeart letterhead reading "Mining Gold at Coloma (Sutters Mill) California about 1850-51, The center figure - with shovel is Martin Allhoff of Coloma - This presented to Phil B. Bekeart by Martin J. Allhoff - son of Martin Allhoff"; daguerreotype easily viewed, case hinge separated, Very Fine.